This substantial teapot was hand built using a comic pattern. After the pieces were cut, texture was applied with roller tools. A spout made on a mandrel and a pulled handle were added. The lid was also hand built, and has a deep flange to keep the lid in place while pouring. 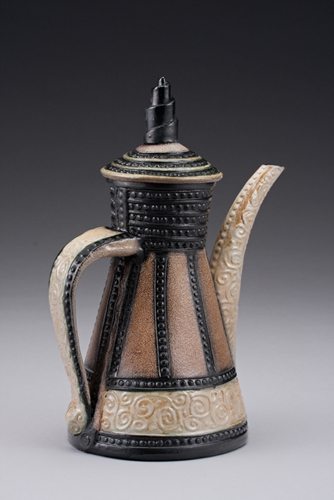 Slips were painted onto bisque, and the the teapot was fired to cone 10 in a salt kiln. 10″ Tall, $150, Sold.